The crowd at Turner Field in Atlanta had every reason to be chanting Eddie Perez' name. And they did, according to The Associated Press, chanting "Ed-die!, Ed-die!" They chanted after the catcher who replaced the injured Javy Lopez mid-season hit his second home run of the 1999 NLCS and helped send the Braves to a 2-0 series lead over the Mets, The AP wrote. "That's the easiest name for them to say," a realistic Perez told The AP afterward. "Next year they're going to forget about me because Javy will be playing everyday." The next year, Perez would be back to his limited role. But he continued playing. By the time he was done six seasons later, Perez had amassed a total of 564 major league games played over 11 major league seasons. He also ended with a total of 40 regular season home runs, in addition to those two big postseason shots in 1999. His first major league hit was a home run. Perez' career began back in 1987, signed by the Braves as a free agent out of his native Venezuela. He is also sometimes referred to by his given name, Eduardo Perez. 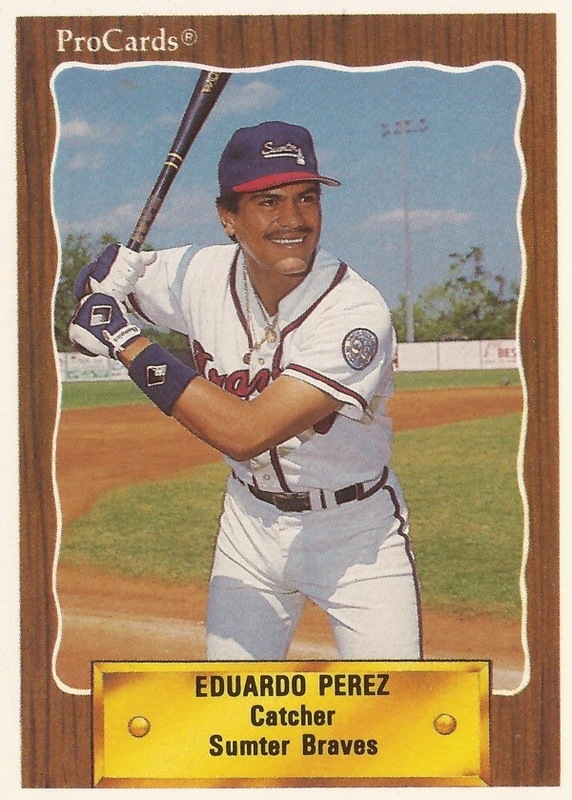 Perez started with the Braves that year in the rookie Gulf Coast League. He made single-A Burlington in 1988 and high-A Durham in 1990. It took Perez until 1994 to make AAA Richmond. Then, in 1995, his ninth season as a pro, Perez debuted in Atlanta. Perez got into seven games for the Braves that year, going 4 for 13. His first hit came Sept. 15 - a home run. The next year, he got into 68 games, hitting .256. He also became Greg Maddux' personal catcher as the Braves pushed for a return to the post-season in 1996. Perez' work with Maddux was noted in Game 6 of the NLCS when the defensive catcher was lifted for the hot-hitting Lopez, The AP wrote. Perez stayed with the Braves and he got significant through that 1999, getting into at least 61 games each year. Then, when Lopez went down in 1999, Perez became the regular starter. "I have to show what I can do," Perez told The Rome News-Tribune that July after Lopez got hurt. "I don't have this chance too much, so I have to do the best I can." Perez hit .249 with the Braves that year, with seven home runs and 30 RBI. He hit .341 that post-season, helping Atlanta return to the World Series. Perez stayed with the Braves through 2002, but he got limited time, seven games in 2000 and five in 2001. He moved to the Indians in 2002 and got into 42 games with the Indians. Then, in 2003, Perez arrived with the Brewers and got into 107 games. By that July, Perez was hitting over .300. "I've always said that Eddie might not get a lot of hits, but the hits he does get are in clutch situations," Milwaukee manager Ned Yost told The Milwaukee Journal-Sentinel. "Eddie has proved me wrong this season. He's getting hits in all situations." Perez ended with a .271 average. He also hit 11 home runs. He returned to the Braves in 2004, getting into 74 games. He then got into 16 final games in 2005, ending his major league career. Perez has since stayed on with the Braves as bullpen coach, a job he continued in 2014.